Two years ago Ken Ham very publicly promoted what he believes is a biblical model of evolution to explain the diversity of life on Earth. I have a book before me that provides compelling evidence that his model of evolution is wrong. That book is the Bible. For those that follow young earth creation literature nothing that Ken Ham said in his debate with Bill Nye was surprising but I suspect that most of the national audience was surprised to hear how Ken Ham talked about the origin of species. He talked about a Biblical creation model of the earth’s origins but when it came to the origins of species he might as well have called his view biblical evolution. 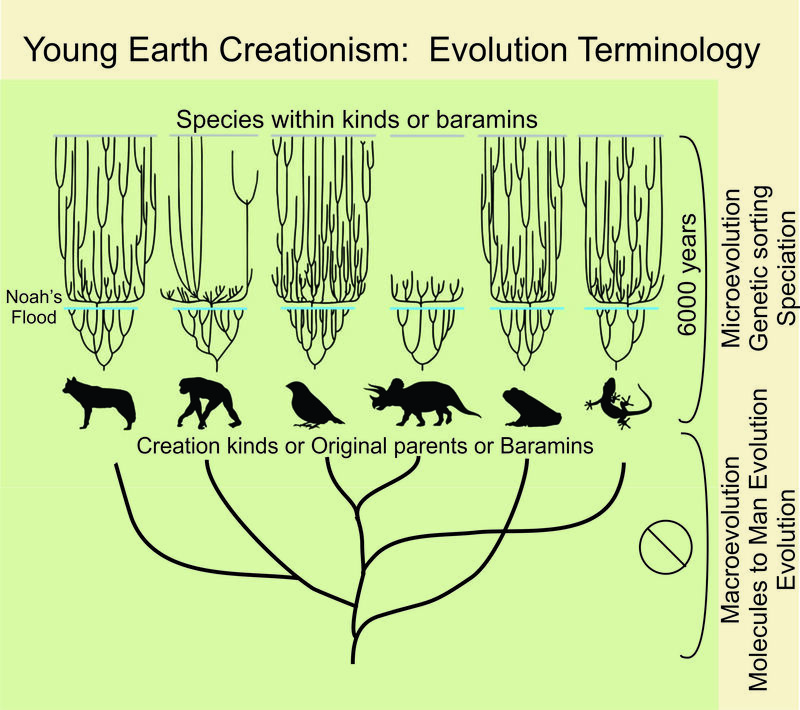 The YEC biblical evolution model. Screen capture of a slide from Ham’s presentation during the Ham/Nye debate Feb 4 2014. I have written many times about how young earth creationists have been embracing massive species formation after the Flood. (See: Invoking Super-Speed Evolution: How to Fit 10,000 Species of Birds on the Ark; Thoughts on Baraminology; When is a Horse a Horse: The Species Definition Problem; Ken Ham’s Darwinism: on the origin of species by means of hyper-evolution after a global flood). I want to just focus on one point that Bill Nye brought up which I thought was accurate but not explained well. Nye pointed out that if there was massive species formation (Ken Ham can call it diversification, genetic sorting or whatever he wants, it is still the creation of new species from an ancestral species) there is a rather obvious prediction of this super-speed Biblical evolution model: Species would have to have been created on a generation by generation basis. To get all the species we see today species would have to have forming at unbelievable rates in the past and even into the present. Take the finches of which Darwin’s finches are just 10 of 1200+ species! For a pair of finches to give rise to 1200 species of finches in 4500 years would necessitate that we should be able to witness species formation right before our eyes. Or at least we should have reports of people who have witnessed brand new species being born. Ken Ham claimed that the Bible predicts the presence of “evidence confirming after their kind”. Presumably he is suggesting that because some hybrids can be formed between some canines that this proves the Bible is correct about kinds. But how does this prove that all species evolved from pairs of kinds on the ark? Animals mentioned in the Bible are the same species we see today! I have a book before me that provides compelling evidence that Ken Ham’s view of Biblical evolution is wrong. That book is the Bible. Massive fast-paced evolution has not happened in the recent past. I know this because the Bible refers to or describes over 100 animals. In most cases we can be quite certain from the descriptions that these animals represent species that are still around today and look the same today as they did when the biblical authors laid eyes upon them. 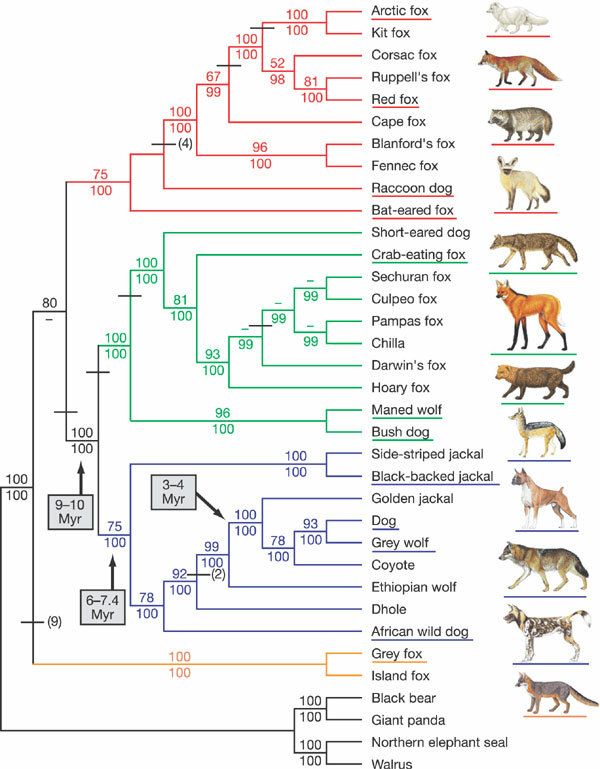 The YEC model suggests that a pair of canines got off the ark and then changed into many species of foxes, wolves, coyotes, and domestic dogs. If this is the case we should find many intermediates of these living in historical times. But what do we find in the scriptures. We find that even in the earliest records, people easily distinguished between foxes, wolves and domestic dogs and probably jackals. We can also go to extra biblical sources like Egyptian writings and see images of domestic dogs which look like breeds of dogs that live in Egypt today. We even have mummies of dogs and other animals that confirm that they are no different from those we see today. It seems that there is no evidence of speciation here at all but rather fully formed species that have maintained the characteristics of species since their very first mention in scripture. A proposed relationship tree of all living species of canines. The dates on the tree represent estimates of times of divergence (millions of years) based on fossils and genetic analyses. The other numbers are a form of confidence interval regarding the ancestry relationships. Ken Ham says that all of these species of canines really do have a common ancestor but rather than that ancestor living 15 million years ago it lived only 4500 years ago. What about other animals groups? There are donkeys, mules, and horses in the Old Testament but YECs say none of these were on the ark. Rather, they claim only a pair of something like a generic equine was present. There are bison, buffalo, and other cattle in the OT. There are gazelles, addax, antelope, and deer (see my recent post: Are Ruminants Derived from a Common Ancestor? Ruminating on the Meaning of Noahic Kind). There are domestic cats, lions and probably a cougar. Egyptian writings clearly identify both female and male lions and they had multiple forms of domestic cats. The earliest paleolithic drawings depict lions and other types of cats. So it appears that cat species were well established during the earliest biblical times. The book of Job, which YECs often claim is a very early book recording events right after the Flood, records many animals that are just as we know them today such as the Ostrich (Consider the Ostrich: Job 39 and God’s Commentary on Creation; Consider the Ostrich: Adapted for the Present World Part III). What about camels? Yep, they seem to be just like camels today. Ancient drawings of camels show all the familiar characteristics that are familiar to all of us. 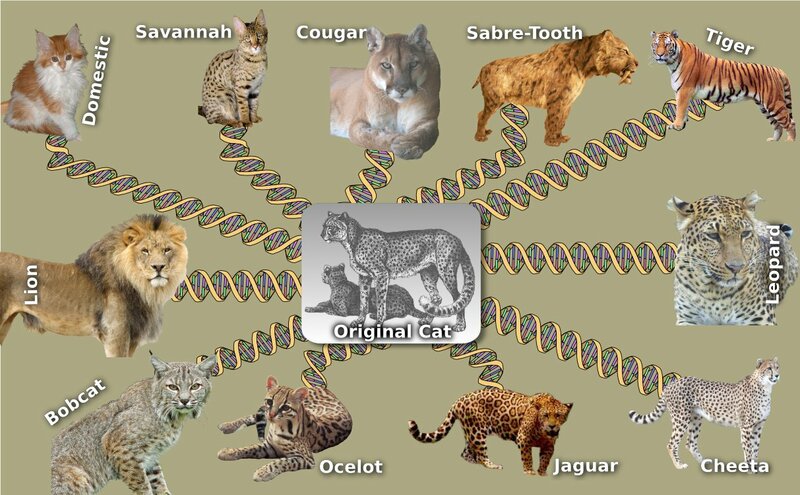 Typical YEC view of the evolution of cats. As if a pair of cats would give rise directly to lions, tigers, cheetahs and domesticated cats. Cats species seem to be just as they are in the Bible. There is no biblical evidence for these dramatic changes during the past 4500 years. I could go on and on but I think the point is made that the there is absolutely no evidence in the Bible that animals have been rapidly morphing from one species into another. In fact evidence derived from the Bible suggests little if no change in species boundaries over the past 4000 years. So why are YECs claiming something for which there is NO biblical support? Because they have a more pressing problem: how to fit all those animals on the ark. By only requiring a pair of each “kind” on the ark they think they have solved that problem. Ken Ham actually mentioned this in his debate. But by making this claim he has created myriad of other problems for his creation model of evolution. 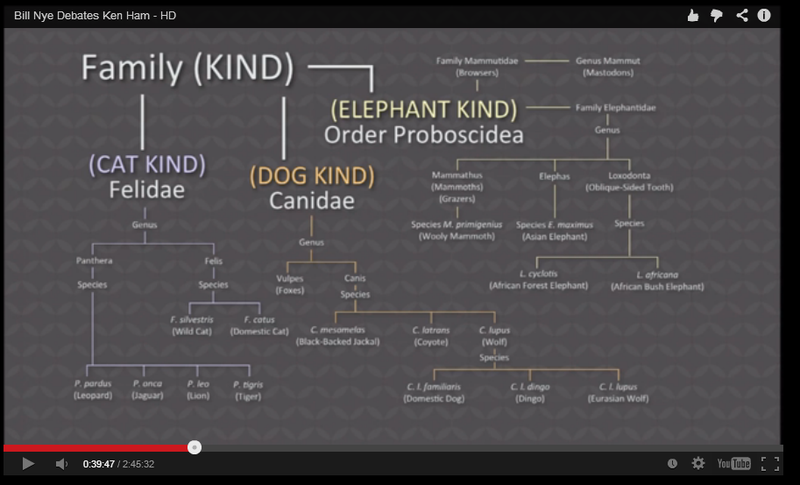 Ken Ham’s slide that shows the elephant kind is probably the most instructive here. He includes mastodons and mammoths with the living elephants as members of the same kind. 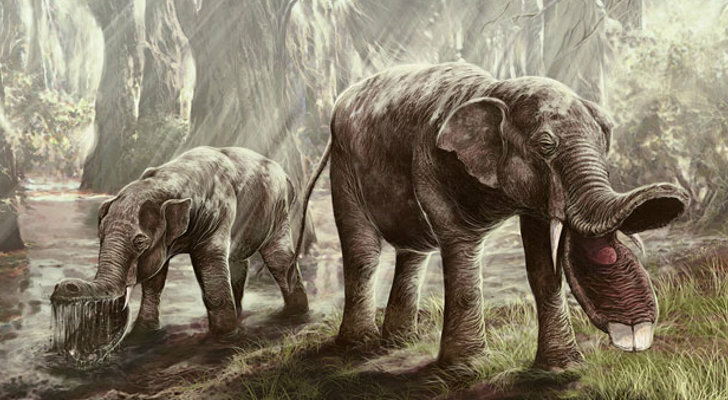 So there were only two elephants on the ark that evolved into these elephants but he also needs to include some as many as 150 extinct species of elephants that included many strangely tusked and trunked ones (see my article: A Trunk and Tusk-Challenged Fossil Elephant). Let’s think about the genetic challenges. Mastodons and modern elephants are thought to have diverged from one another 25 to 30 million years ago. That is based dating of the fossil record but also on the total amount of genetic divergence seen in the mastodon and modern elephant genomes. To give you some perspective, these species are more than twice as different with respect to their genomes as humans and gorillas. And yet Ham and associates are saying that these vast differences in genomes could have been created in just a few hundred years! Wow! But how? I have seen NO genetic models from YEC scientists for how this could have happened. Certainly nothing we know about genetics right now could explain such dramatic changes in such a short period of time. Can modern genetic theories explain that much genetic change in 25 million years. I think they certainly can but that doesn’t help Ken Ham. A good critique of the debate on Age of Rocks pointed out (Ham and Nye agree: Ken Ham’s creation model is not scientifically viable) that elephants are especially problematic for the biblical evolution model. This is because elephants have a long generation time. It takes a decade for an elephant to become sexually mature and then they only have a few offspring during their long lives. How could 100+ species of elephants each of which had doubtless millions of members have been derived from just two animals only 4500 years ago? Over 2000 tons of tusks of just one species, the mastodon, have been sold on world markets in the past 50 years. It is estimated that this represents on a tiny fraction of the estimated 140 MILLION tusks still trapped in the Siberian tundra. There are likely millions of mastodon fossils as well and we are not even considering that fact that a majority of mastodons that died would never have been fossilized. Mammoths and mastodons are recorded in very old rock art and so we know they were present long ago and as long as people have seen them they never experienced any significant changes. So how can Ken Ham claim that the Bible’s prediction of change within a kind is borne out by evidence? A biblical evolution model that compresses massive amounts of evolution into a small amount of time is neither supported by evidence gathered from the natural world or the Bible. YECs have proposed biblical evolution as a purely ad hoc theory to help them escape other perceived problems with their flood geology model of Earth’s history. *Regarding fossil species: there are many fossils of extinct cats, canines and elephants. Some might wonder if young earth creationists think that these are part of the fossils formed in a global flood. The answer is: not usually. This is because the fossils of theses mammal groups are all found in the upper portion of the fossil record which they consider to be post-flood deposits. That raises a natural question: were there no cats, dogs, elephants, whales, cows, etc.. before the flood? If there were why are there NO fossils of any of them but so many of dinosaurs? ** This article has been updated from one written soon after the Ken Ham/Bill Nye debate in February 2014. « Titanosaurus: Largest Dinosaur Ever Found But is it the Largest Animal? As always, good stuff! Thank you. NOTE: Your single-asterisk footnote ends mid-sentence. I wonder what is missing? Yeah, that is a good question. What was I going to say there? This was a revised version of what I said 2 years ago so I want back to the original and it is also missing the end of that sentence. So here is what I think I was thinking back then and would say today: “That raises a natural question: were there no cats, dogs, elephants, whales, cows, etc.. before the flood? If there were why are there NO fossils of any of them but so many of dinosaurs?” Put another way, if all the cats including the fossils species we have today evolved from a pair on the ark, what came before the flood? Surely the pre-flood world must have had an entirely different set of animals but in the AIG Creation Museum they portray the garden with animals that we would recognize today. They are horribly mixed up and confused and are sending mixed messages right and left. There new add for the Ark Encounter shows pairs of lions and another cat species but their literature suggests neither species existed at the time of Noah. What is your take on AIG’s explanation of how fish “kind” survived, since they usually leave them out of their calculations for room on the already impossibly packed Ark? That is a great question. I haven’t thought about fish “kinds” much but it does highlight a problem I haven’t been able to find a good way to articulate in post. AIG believes in this super fast-paced evolution of air-breathing land animals to explain their current diversity and to make room on the Ark. So what about the other 99% of species on Earth like fish? What about whales, were they one “kind” and evolved into 88 species and 150 fossils speciesl since the creation or only after the Flood? Do insect also undergo hyperevolution? Looking at the genetics of other species on earth I see nothing that makes land animals look much different in terms of levels of diversity than other groups of organisms but only land animals were caught in the extreme bottleneck of Noah’s ark. In my mind AIG should predict that the ark was a genetic bottleneck that should have resulted in less genetic diversity in animals than plants which could have had many species survived the flood not just one pair of a kind of plant. But again, such a difference doesn’t exist and this is just another piece of evidence that doesn’t fit Ken Ham’s biblical evolutionary model. All fish and sea organisms were obviously in the oceans during the Flood and were not on the ark. The problem, of course, is that no macroscopic water-dwelling animals would have survived either. Neither saltwater nor fresh water fish can tolerate significant (or even small, in many cases) changes in the salinity of their environment, and those few that can transition require a period of time to acclimate to the change (http://www.livescience.com/32167-can-saltwater-fish-live-in-fresh-water.html). Additionally, since YECs also believe that the flood is responsible for all or most of the sedimentary deposition seen around the world, that would mean that during the flood, all or most of the matter which eventually settled into geological strata would have been suspended in the water. Given the observed volume of global strata and the proposed volume of water needed to cover the globe, the water would have been little better than thin mud, surely enough to quickly kill anything that breathed with gills or attempted to swim in it. Furthermore, according to a strict literal reading of Gen. 6:17, wherein God promises to destroy “all the living creatures that have the breath of life in them”, Noah would have also had to make room for cetaceans, sirenians and pinnipeds (whales, manatees and seals), since they, too, breathe air. IMO this is or could become a huge issue due to its direct and easy-to-understand nature (compared to more complex stuff like radioactivity that is easier to hide behind uncertainty about, etc), especially with the coming ‘ark park’ that may make these challenges harder to hide. Though my biases have changed and viewpoints widened enough over the last couple years that I can’t be sure how hardline YEC’s may continue to justify their model. Continuing with the idea sometimes expressed here that it is hard for YEC’s to admit any faults with their model if they are more personally sure of their faith and they don’t believe any other models are Biblically viable (to which I can relate from personal experience), I wonder if the environment is ripe for an OEC to kindly but confidently present this ark-fitting problem and argue for resurrecting the old-earth, limited flood model that goes back as far as 19th century geologist-theologians like Hugh Miller and Edward Hitchcock, reminding YEC’s that this was commonly accepted by most Christians including, the most fundamentalist among us, for nearly a hundred years. What I find striking about the ruminants example is just how impossible it would be to not notice these dramatic changes. Livestock were integral to the societies of the biblical authors, how is it that not a single verse of scripture, or the middens of thousands of ancient villages, don’t record any sort of “transitional” forms? If this kind of evolution really happened rapidly and frequently, it would be obvious from archaeology. I’d have to wonder, if Noah had only the most basic “kinds,” what clean and unclean animals was he so concerned about in the narrative? It seems as if the issue isn’t whether or not a YEC can accept evolution, but how much is allowed. You say,” if Noah had only the most basic “kinds,” what clean and unclean animals was he so concerned about in the narrative?” Noah was not concerned at all about what clean and unclean animals were coming on the ark, since it is G-D who brought All the animals onto the ark that Noah had prepared and at G-D’s appointed time He shut the door to the Ark. G-D knew what He was doing and He gave the right dimensions to Noah because He knew how much room was needed for them all. At some point you have to decide if you are going to believe what G-D says in His Word. But right here, I wanted to respond to your proposed “solution” (to a problem that may not exist). So, according to what I can see of what G-D says in His Word, your proposed solution [to a problem that may not exist] doesn’t work. Perhaps you or others who are engaged in these conversations could reply? Are there any obvious examples of “mixed” “clean” and “unclean” animals in any of Mr. Ham’s/AiG’s proposed “baramin[s]“? Well, it would depend on how broadly we want to define “kind.” If the proposal NH discussed in a previous post is accepted among YECs, and all ruminants are collapsed into one “kind,” then we would certainly have a mixing of clean and unclean animals! If the existence of doves and ravens on the ark is anything to go by, Ham’s vague definitions of “kinds” are too broad for what’s allowed by the biblical text. But as you said, this may not even be a serious problem, it’s a relatively minor issue that I was simply wondering about. The real problem is the obvious ad-hoc fabrication of AiG’s “baramins,” and their super-speed evolution. There is no evidence in the biblical text, archaeological record, or the field of genetics to support what Ham and other YECs propose regarding “kinds” and post-flood evolution. It’s an idea that only exists to fix the problem of how to fit all land animals and birds on the ark, not a conclusion drawn from any sort of exegesis or scientific evidence. They’ve created more problems to solve a problem of their own making (their interpretation of Genesis). If anything, the Bible teaches FIXITY of species (and that EVERY species of land animal was somehow on board the ark). There really isn’t any indication that insects were aboard the ark, just mammals, birds, and MAYBE reptiles. The hebrew for “creeping thing” typically does not refer to insects, and on the rare occasion it does, it’s used together with “swarming” which is mostly used on its own to refer to bugs. As for the fixity of species, although I think the fixity of species is (mostly) a correct principle, I don’t think the bible directly teaches it. The bible simply says that God created all the different sorts of animals and plants on earth. As this article points out, it indicates that animals say, at the time of Abraham, are the same as they are today. Though if by fixity of species you mean “no change can occur after supernatural creation at all, for any reason”, I have to disagree, the bible acknowledges different races, and yet claims they all come from Adam and Eve, with no indication of supernatural transformations in between. Presumably assuming races emerging through some natural process (though of course they did not know what that process was). My point was that there is no hint of speciation in the Bible therefore the original Christian assumption was ‘fixity’. Not a direct teaching – but the ‘default position’ in so far as the Bible ‘addresses’ scientific topics such as biology. Yeah, the whole “kind” issue exists only because YEC’s have to fit so many animals on the ark. Whereas I don’t have that problem, taking the local flood view. I’m pretty sure that, given their timeline, and the long-lifespans of elephants, there would have to be massive changes with each generation, the mutations it would take to do that would result in rapid death due to cancer and other defects. Their model simply doesn’t work. @wowfunny251: One of my ongoing “problems” with the OEC models, including the local flood view, is that “their model[s] simply [don’t seem to] work,” either, upon a relatively straightforward [traditional evangelical] concordist reading of Scripture. There are a lot of rather anomalous data points in those other [traditional evangelical] concordist models as well. And so those of us who like to think of ourselves as in the evangelical camp are faced with some serious biblical-hermeneutical-theological work to do, to respond to the reasonable (serious) biblical-hermeneutical-theological questions that our brothers and sisters feel acutely. If those of us who like to think of ourselves as in the evangelical camp but who believe in an old earth and/or a local flood (etc., etc.) are unwilling and/or unable to respond to those biblical-hermeneutical-theological questions, then maybe the YECs have reason seriously to question our proposed old-earth, local-flood theories as being appropriately evangelical. Maybe we should, correctly, abandon our commitment to “the” evangelical faith. It is because of these concerns, I disagree with your suggestion that the YEC model “simply” doesn’t work. So far, I haven’t found that the OEC model “simply” works, either! And for these reasons, I find these kinds of discussions inspiring and hopeful, yet challenging and, sometimes, even painful.
. . . I guess what “inspired” my comments here was your use of the words “only” (“the whole ‘kind’ issue exists only because YEC’s have to fit so many animals on the ark”) and “simply” (“Their model simply doesn’t work”). I’m afraid there are few “simple” matters in this field of inquiry! “It is because of these concerns [about what it is to be evangelical], I disagree with your suggestion that the YEC model “simply” doesn’t work.” But the not working referred to is logical and scientific. So you must either broaden your idea of what it is to be evangelical (as Dennis Venema does over at Biologos), or abandon the attempt to be evangelical, or retreat into a Ken Ham-like fantasy world invulnerable to logic. I am a concordist for one. But my point was mainly that the YEC model simply doesn’t work from a scientific perspective. I wasn’t talking about a biblical perspective, though I do think there are major problems with YEC theory from scripture alone. I don’t think being evangelical has anything to do with YEC vs. OEC vs Theistic Evolution or even concordism. Being evangelical just means being a bible-believing christian, who accepts core tenants like the resurrection, the trinity, etc. It’s true that any position has serious questions to wrestle with, both the bible and nature are complex things that aren’t understood simply. I think you misunderstood my original intent of the word “simply”, I wasn’t implying that OEC (as opposed to other models) is “simple” and works easily. I just meant that YEC theory just doesn’t work scientifically, and I was putting it “simply”. As for “only”, I stand by that, YEC’s did expand their definition of “kind” solely (only) to accommodate so many animals on the ark, not for any hermeneutical purpose, or for any scientific reason. Thanks again for exploring these issues. I never thought this was the case – in fact, I think I have heard other YECs state otherwise. They would say that with dog breeds, for example, we have basically exhausted the possibilities allowed from the DNA of the original dog kind. The same would hold true for the “speciation” we see with the non-man-led breeding. Hi Nathan, yes, I think that would be the general position of YECs, they would see a massive burst of diversification – genetic sorting in their words – right after the flood and then species would have settled out and been rather fixed from that point. Interestingly this is not what they show in their figures such as the one I show above which is mostly derived from an AiG figure. They show constant branching of species up to the present day. In my figure of theistic models of origins I recognized this is most common YEC viewpoint by showing straight lines with no branches. https://naturalishistoria.files.wordpress.com/2015/12/theistic-models-history-life-creationism-evolution.png?w=660&h=495 All of that said, the genetic of that argument makes no sense since genetic sorting takes significant time and doesn’t happen within a generation. Their rapid diversification would require a whole set of genetic mechanisms that were apparently in operation 4500 years ago but we can’t observe today. Domestication does tend to rapidly reduce diversity and YECs often point to domesticated animals such as dogs and cats as evidence of recent rapid morphological change. But these all experience real genetic sorting and under severe directional selection like as is the case in artificial selection such sorting does occur in just a few thousand years. But “wild” species have huge amounts of genetic diversity so if there was massive sorting of limited gene pool in the pair of common ancestors on the ark YECs should predict species today should have very very reduced genetic variation but most do not and thus show little sign of having gone though severe genetic bottlenecks. I also think the fossil record of those kinds doesn’t support the rapid diversification either. Thousands of species of ungulates, felines, etc.. would have had to made it all the way to North America before the speciated and then became extinct before man got there. How they made it to North America before speciating and thus no leaving any evidence behind in the rest of the world is a mystery. New thoughts for me. And, again, areas in which I am uneducated (which is why I am listening to you!). Let me say before hand I am no fan of Ken Ham, but his theory and this otherwise very thorough rebuttal raises the question of punctuated equilibrium, as a few non-believing evolutionists have theorized? There seems to be a similarity between the two theories, at least in the limited number of articles I’ve read on PE. I would think that the same data that refutes PE refutes Ham’s idea as well. Any additional info you might have would be welcomed reading. The timescales are totally different between punctuated equilibrium and Ham’s model; “fast” in geologic time is still hundreds of thousands if not millions of years not hundreds. Blessings! I am so, so, so, soooo Thankful to find a fellow Christian who understands the process of Science! I’ve tried to find ways to explain this to friends, but unless they really, really trust me, or have their own technical training, it is almost impossible. Please keep up the good work. By the way, I’ve been a Believer since early childhood, and a scientist pretty much since. I never found a contradiction between Faith and the study of God’s creation, except in the minds of those who try to push these apart. the first problem is the assumption that this could not happen. Since no one is alive who was there when the animals got off the ark we cannot say that genetic diversity did not take place at a great speed. remember there were only 8 humans at the time and the animals would not have been bothered for many years so they had a great window of opportunity to procreate and genetics had space to diversify. Second, who says that the number of supposed species classified today are actually different species? We have been inundated with articles of scientists expounding upon their different species discoveries yet produce only one example of the species. Who is to say that the differences in the animals means a different species and not some alteration due to the varieties of imperfection in this world? Third, Ken Ham’s thinking does not assume that a single solitary one celled organism contained all the genetic information needed to provide diversity of the species, like evolutionists do with their theory. Since the evolutionist cannot discover and demonstrate the idea of information generating through process this is the conclusion we are left with–evolutionists think that a single solitary one-celled organism produced all the genetic information needed to produce not only diversity in animals but other life forms as well. The fact that the many two pairs of different kinds of animals containing the genetic information needed for diversity is much more logical, rational and plausible than the evolutionary alternative which cannot produce the source for this new information that was gathered over the generations and passed on to specific different lines of species. Evolutionists have no source for information addition and no method of distribution of this genetic miracle they claim took place. The Bible makes more sense and provides the right answers than any form of evolutionary thought. What’s the toothy elephant in the post, if I may ask? Err – where did Noah put the termites?? ?